NatureWash technology provides an eco-friendly, cold-wash laundry system that improves the quality and cleanliness of your laundry. Designed for semi-commercial applications up to 25 lb. washers. 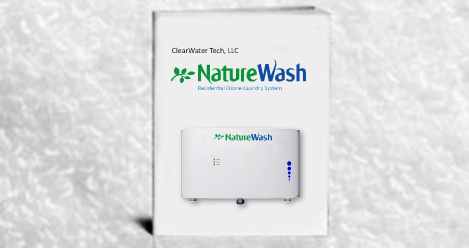 NatureWash transforms cold water into a powerful cleaning agent by mixing normal tap water with ozone, nature’s safest, and most effective disinfecting agent, into the wash water. NatureWash reduces energy consumption, water use, cycle times, drying times, detergent use, chemical use, and extends fabric life. Linens are softer to the skin, cleaner, and smell fresher. NatureWash is a true green product. Dimensions: 10.55” h x 17.12” w x 5.50” d; 5.4 lbs. – Aluminum enclosure with white powder coated finish. – Simple installation and access for servicing. – Inlet/outlet manifold constructed of schedule 40 PVC and Mazzei venturi. – Washer hose type connections on inlet and outlet. – Custom designed PCB to control ozone, indicator lamps, LEDs and track time to service. – Flow switch to sense water flow. – Leak detection with audible alarm and service light. – Service light illuminates after predetermined hours of operation. – Two keyhole-type holes on back of enclosure for wall mounting.